The opening day of the 35th America’s Cup Match delivered some truths as the Kiwi Challengers took back-to-back victories over Defender Jimmy Spithill’s ORACLE TEAM USA in the first two races. We learned Peter Burling’s Emirates Team New Zealand was not fazed by the narrative which had depicted Spithill as the superior starter, as the Kiwis were 2-0 off the start line. We also learned, or confirmed, the Kiwi team is crazy fast in the 8 knot winds seen today. Result: The Challenger won both races, but is only up 1-0 due to the scoring system that benefited the Defender due to their performance earlier in the qualifier stage. The match-up between ORACLE TEAM USA and Emirates Team New Zealand is a rematch of the 2013 America’s Cup Match in which ORACLE TEAM USA staged what many call the greatest comeback in sport. Then, the US team turned an 8-1 deficit to their Kiwi rivals into a 9-8 victory in San Francisco, setting the stage perfectly for the mother of all grudge matches which is now taking place on Bermuda’s Great Sound. “Everyone connected to our team has been working incredibly hard to try and give us a fast boat and it is incredible to be able to reward them with two victories today,” said Peter Burling. However, despite Emirates Team New Zealand securing back-to-back victories on day one, Burling is not getting carried away just yet. “Jimmy (Spithill) and ORACLE TEAM USA sailed really well to put us under a lot of pressure, but we managed to keep our composure and sail really well. “We’ve said all along that we are learning all the time and although we won both races we got a lot wrong and made too many mistakes today. “We will go away and look at what we need to improve because we all know for a fact that Jimmy (Spithill) won’t give up and so we have to keep progressing. Despite relinquishing the point advantage they held at the beginning of the day, ORACLE TEAM USA helmsman Jimmy Spithill is refusing to panic, especially with the experience of overturning an 8-1 deficit to the same opposition in 2013. “We’re obviously disappointed with what was a tough day, but the deficit is only one point so we we’re not panicking,” said a defiant Spithill. But that won’t stop others from drawing conclusions. Burling had been criticized for his starting acumen on days when his boat was clearly not set up correctly. But today the boat configuration matched the winds, and Burling more than matched Spithill. Jimmy Spithill’s ORACLE TEAM USA made the worst possible start to their defence of the ‘Auld Mug’ as they were handed a penalty for crossing the start line fractionally early. The penalty handed the initiative to Emirates Team New Zealand, and Peter Burling took full advantage, sailing well clear of his rival Spithill, holding a 32 second lead by the turn at the second gate. In relatively light winds, Burling continued to sail smoothly, extending the Kiwis’ advantage to a healthy margin of one minute and 52 seconds over their rivals by the fifth gate. However, Burling did not have it all his own way and mistakes began to creep in. Two poor manoeuvres reduced Emirates Team New Zealand’s advantage, giving Jimmy Spithill a slight hope of catching the Kiwis in the closing stages. However, there was to be no late drama, as Burling’s team crossed the finish line 30 seconds ahead of Spithill’s ORACLE TEAM USA, wiping out the minus one point deficit to the Defenders and levelling the overall scores to 0-0 ahead of race two. Having cut the point deficit, Peter Burling and Emirates Team New Zealand set about building on the momentum of victory in the first race by again beating Jimmy Spithill’s ORACLE TEAM USA away from the start line. Race two was much closer than race one, but Emirates Team New Zealand were still able to pull clear, establishing a lead of up to one minute, 34 seconds by the time they rounded mark four. However, once again Emirates Team New Zealand gave their rivals a glimmer of hope in the closing stages as ORACLE TEAM USA dramatically cut the gap to Emirates Team New Zealand on the run to the fifth mark. As both boats headed towards the turn the gap was down to just over three seconds, and it looked like the US team might record their first win of the America’s Cup Match, presented by Louis Vuitton, but it was not to be. “Halfway way up that second beat we definitely lost a lot and we have to go away and keep learning and improving,” admitted Burling. Having closed the gap, ORACLE TEAM USA’s yacht came down off its foils and that gave Emirates Team New Zealand the chance to re-establish their lead. “I think what happened is that we lost a rudder,” revealed Spithill, reflecting on the manoeuvre that all but ended their challenge. “We’ll have to go back and look at that because it was obviously a key moment in the race.” With the pressure now off, Burling guided his team around the sixth and final gate and coasted to the finish line an entire minute and 28 seconds ahead of Jimmy Spithill’s ORACLE TEAM USA, taking not only their second successive win of day one, but also moving into a one point advantage in the battle for the ‘Auld Mug’. Race One: Emirates Team New Zealand beat ORACLE TEAM USA by 30 seconds. Race Two: Emirates Team New Zealand beat ORACLE TEAM USA by 1 minute and 28 seconds. * Emirates Team New Zealand started the America’s Cup Match down -1 due to ORACLE TEAM USA’s win in the Louis Vuitton America’s Cup Qualifiers. 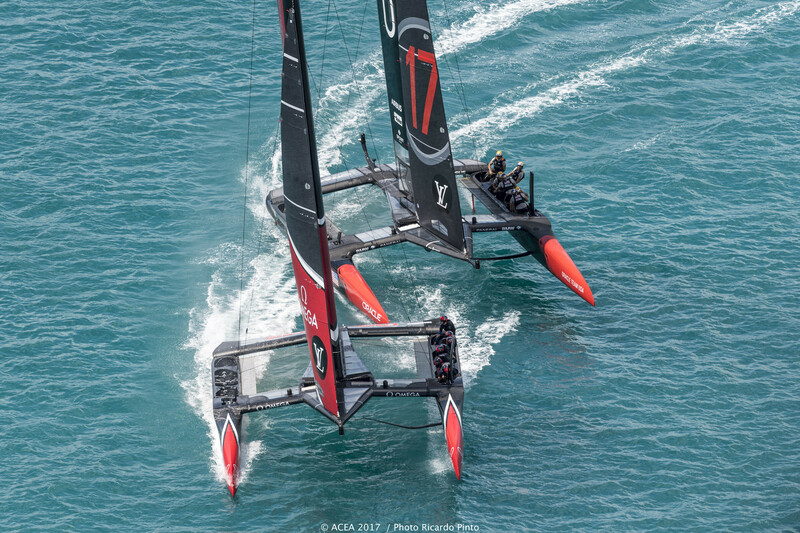 America’s Cup Match (June 17 to 25; may end earlier): The final stage of the 35th America’s Cup – Jimmy Spithill’s ORACLE TEAM USA lines up against Peter Burling’s Emirates Team New Zealand, with the winner to be the first team to claim seven points. However, the caveat is how the Defender, which won the Qualifiers held on May 26-June 3, will begin the series with a one point advantage. As the rules detail, the Challenger will carry a one point disadvantage (i.e. minus 1), meaning they will need to win eight races to take the trophy whereas the Defender need only win seven races.